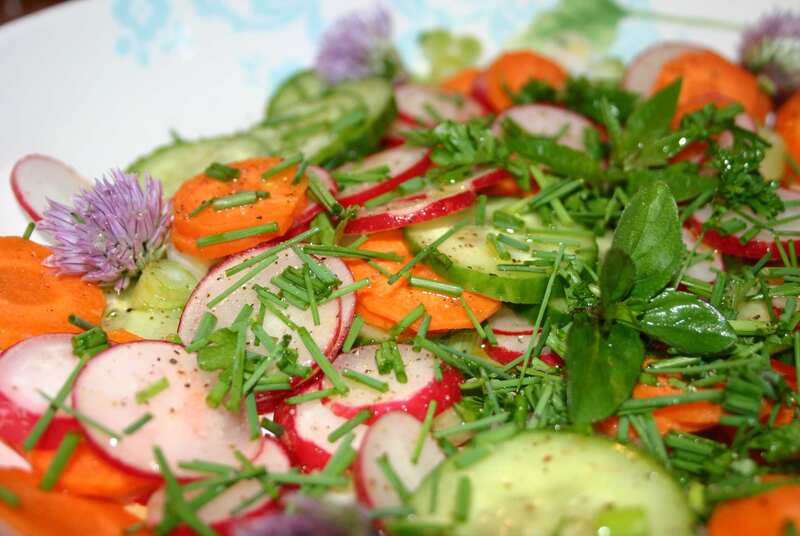 All you need is half a cucumber, a carrot, half a bunch of radishes, a bunch of spring onions, parsley, chives, salt and pepper, and a little olive oil and white wine vinegar. Add any other herbs you have… lemon verbena goes nicely too. Add the chive flowers and enjoy! By the way, chive flowers are quite hot and peppery… a great way to add extra spice to any dish! This entry was posted in Food, Garden, Herbs & Spices, Recipes, Vegetarianism and tagged Food, Garden, Herbs, Postaday, Recipes, Seasons, Spring, Vegan, Vegetarian. Bookmark the permalink. This looks great. Such a great salad!! 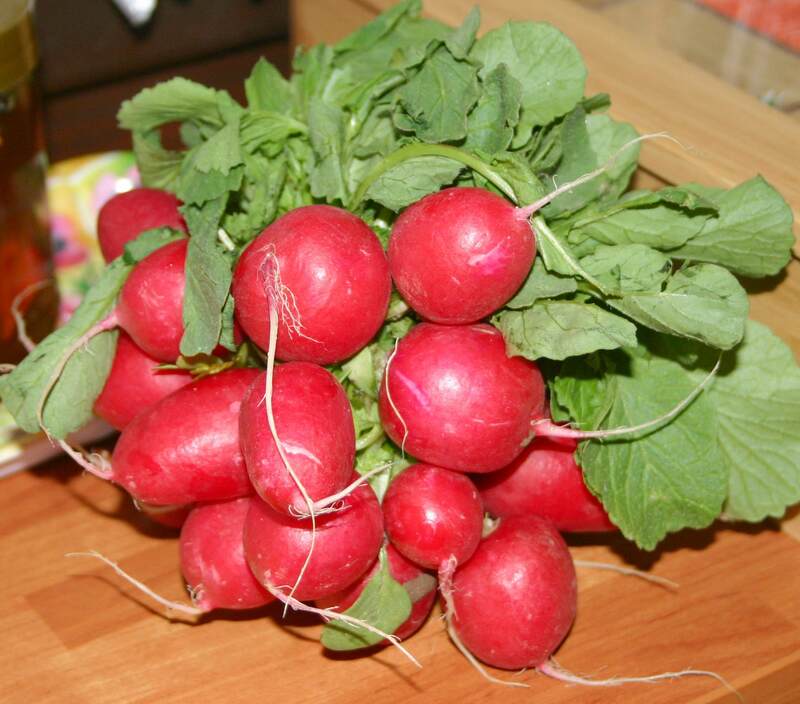 I love radishes! That looks colorful and refreshing! Of course! Me Too! It looks lovely! I am thinking when I move in a few months (6 mos. give or take) I want to start a small balcony garden and window box of herbs. Any advice you have is welcome haha! Chive flowers can be eaten? I´ve always been told not to eat chive when it flowers. Yesterday in a farm-museum-garden I saw beautiful chives-flowers. It is the time of violet (lila in german) coloured flowers. Such an appetizing salad! 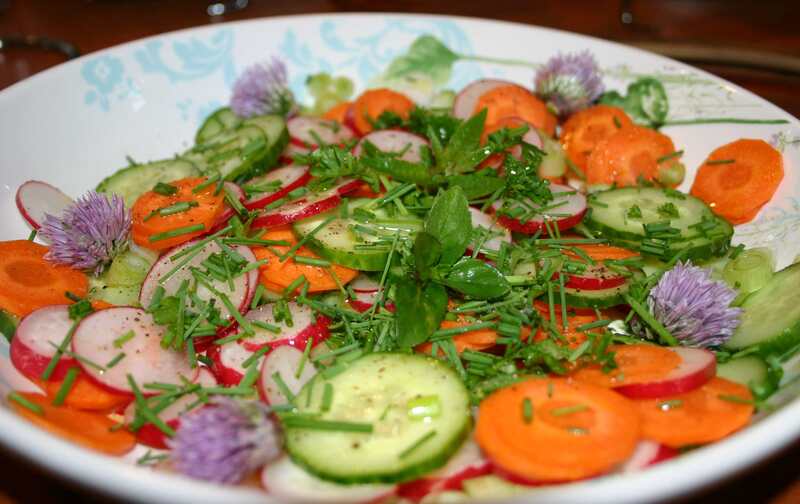 I wished I could eat more fresh vegetables and salads…. Now that’s a plate of real sunshine! Best part about eating the chive blossoms? Not having to rip out all those seedlings! That looks lovely! The lemon verbena (as I know now 😉 ) is a very good idea. I didn´t know that chive flowers are edible. On your blog is so much to learn! Not only does it look great, your salad is picture perfect. Oh, and thanks for reminding me that I need to buy a new lemon verbena plant!! What a lovely colorful salad! I am growing chives too and did not know you could eat the flowers either, will have to try it! Hope you like them! It’s amazing how many flowers in our gardens are edible!